To compare the clinical and radiological outcomes of unilateral versus bilateral instrumented in two-level degenerative lumbar diseases after minimally invasive transforaminal lumbar interbody fusion (MITLIF). We conducted a prospective cohort study of 74 patients, who underwent unilateral or bilateral instrumented in two-level MITLIF for degenerative lumbar diseases from May 2010 to June 2012. There were 35 patients in group A undergoing unilateral pedicle screw fixation and 39 patients in group B undergoing bilateral pedicle screw fixation. Demographic data and clinical characteristics were compared between the two groups before surgery. Perioperative data, clinical and radiological outcomes of the two groups were also compared. The mean follow-up period was 32.1 ± 7.5 months for group A and 31.7 ± 8.0 months for group B (p > 0.05). Group A required a significantly shorter operating time, lower implant costs and less intraoperative blood loss and X-ray exposure time than group B (p < 0.01). However, no statistical differences were identified in the amount of transfusion and postoperative hospital stay between the two groups (p > 0.05). 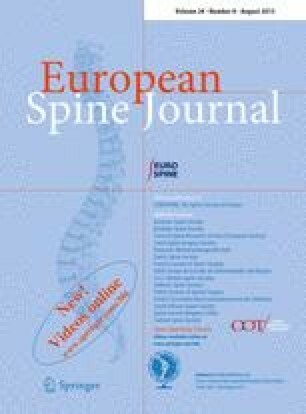 Clinical outcomes assessed by visual analog scores for back and leg pain (VAS-BP and VAS-LP, respectively) and Oswestry Disability Index (ODI) improved significantly in both groups after surgery, and no significant differences existed between the two groups at each postoperative follow-up (p > 0.05). There were significant differences within groups for Cobb angles of the whole lumbar [Cobb (a)] and the whole lumbar lordosis at each time point before and after surgery (p < 0.05). No significant differences existed between groups in relation to Cobb (a), Cobb angle of the fused segments, lumbar lordosis and the segmental lordosis at any time point before and after surgery (p > 0.05). There were no significant differences in fusion rate and total complication rate between the two groups (p > 0.05). Unilateral instrumentation after two-level MITLIF provided similar clinical and radiological outcomes to bilateral fixation in two-level degenerative lumbar diseases. Compared with bilateral fixation, unilateral fixation shortens operation time, reduces intra-operative blood loss and X-ray exposure time, and saves medical expenses with similar postoperative hospital stay and complication rate. G. Gu and H. Zhang contributed equally to this work.